The latest biography from the Dutch death squadron has a wise saying: "the higher you rise, the harder you fall". Guitar player Jens puts this into perspective: "it's a statement that applies to a lot of bands. Whenever you reach a certain height, you soon enough will see the other side of the coin." The benefits from this music alone are not enough to survive. That's why normal jobs are a part of our lives as well. We have been on the road in the States for 5 weeks, then in Japan and next we had two European tours. Try to keep this going conditionally. Not everybody is the same for that matter. Roel (our drummer) plays in another band as well (that wasn't taking too much time previously) and has to make more time for them at the moment. Yet I don't consider ourselves being the high-fliers that fell down. God Dethroned still belongs in the scene with as much devotion as ever before." With Tony Laureano (ex-Angel Corpse) the temporarily thinned out cast could be strenghtened, and the recording of "Ravenous" could go on. It was a job that the drummer was capable of handling. "Tony is a studio musician that is in high demand and he with others, Nile for example. It became clear very soon though that we could not convince him to be a permanent member. When his long term schedule permits, he might be making time to tour with us. If not, we have some other candidates available. We deliberately chose to record the songs as tight as possible and to drive the speed of the songs to the limit. The way Tony plays obviously left a mark on the whole. In several songs you can hear the American influence which was never the case in the past. In general we try to increase the death and thrash portion in our sound compared to the black metal percentage. The production of this CD is a lot bigger and more brutal as well." 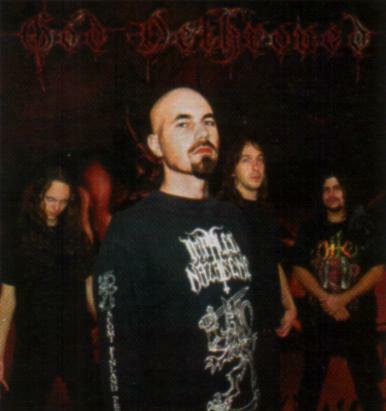 God Dethroned isn't the first band covering the Death classic "Evil Dead". "Since Chuck Schuldiner was ill, benefit concerts were being organized in the Netherlands to raise money for this treatment. All involved bands had to play at least one Death cover. Such a benefit was on the schedule (Hardenberg March 24-see GIGS-/YK) two days after we got back from America (actually the benefit was delayed because we wanted God Dethroned to be a part of it/YK). Due to the short preperation time we had, we chose an older song that was easier to study. When we thought of a bonus track we certainly were going to take this one into consideration, although somewhat speedier." With the obscure cover version of Macabre End (Consumed By Darkness) in the middle and a tribute (Evil Dead) to Chuck at the end, this CD became a beautiful whole.